iTunes allows users to manage music, TV shows, movies, apps, books and other multimedia files on the iPhone, iPad or iPod. However, if these data are not properly managed, duplicates of the same track may exist. Duplicates in iTunes can be really frustrating, let’s take music as an example, sometimes iTunes get multiple copies of the same song, or even two copies of the whole album. when you are listening to music and hit the next, the same song is playing again and again. Even worse, these duplicate files take up much space on your iPhone, iPad or iPod. Now, follow our foolproof guide below to find and get rid of your duplicates, clean up iTunes library and save more space. 1. Make sure you’ve got the latest version of iTunes. 4. Select “Show Duplicate Items” and the same tracks will be listed together for easily removing. 5. Choose your unwanted duplicates and right click to delete them. This method is effective but in some cases, it may not work perfectly if these tracks are named inadequately. This can be simply because you have got your songs, movies or other items from outside the iTunes. The chance of having duplicate tracks in your iTunes library increases as you continue to add items. 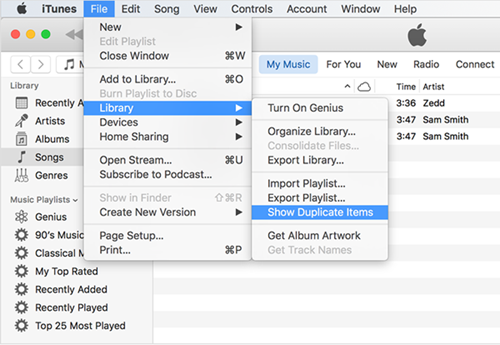 Although iTunes program allows you to search for duplicate tracks, it would be easier to prevent duplicates from adding in the first place by organizing your iTunes library so that all files are kept in one location. 1. Open up iTunes, the go to “Edit”-“Reference”. 3. 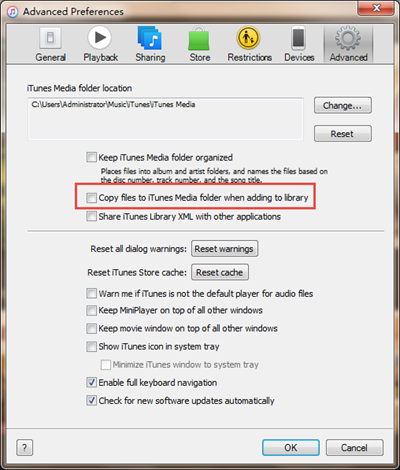 Clear the checkbox that reads “Copy files to iTunes Media folder” when adding to library.